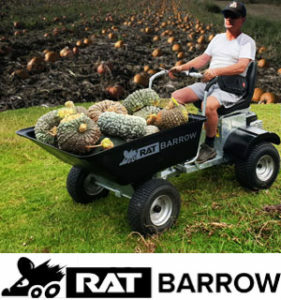 RAT Barrow is a newly released Australian invention designed to improve material handling around the home and small farm. R A T stands for Ride on, Articulated, Tipping Barrow. Its patent applied design is a world first giving the user a safe and stable ride with incredible maneuverability, with loads up to 200kg. Powered by a key start 8.75 Professional Series Briggs and Stratton engine coupled with a Tuff Torq Hydro static transmission provides a reliable low maintenance drive train. The RAT Barrows frame is fully galvanised with UV stabilised poly tub and guards, which are completed with stainless steel fittings means your Rat Barrow will handle all the elements and last a lifetime. RAT Barrow’s biggest feature is its simplicity. The key start Briggs and Stratton engine with automatic choke and fixed throttle means a quick start every time even on frosty mornings. The single variable speed pedal for forward and reverse makes operation a breeze. A large 7lt fuel tank reduces the need for regular refueling, and a transparent fuel gauge window allows the operator to see fuel levels at all times. Tipping large loads is made easy by the balanced load, free tip design. 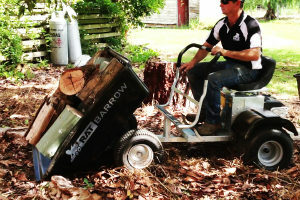 Taking lawn clippings, horse manure or garden pruning’ s from A to B has never been easier. The RAT Barrow has no problem with heavier loads such as fire wood, soil or sand and feed bags can be transported and or tipped with ease. A sturdy tow hitch at the rear enables a RAT Barrow designed trailer to be attached which also tips, doubling carrying capacity. Tub: Polyethylene 150 ltrs (40 gallons), balanced pivot. Winner of the Commonwealth Bank Innovation in Agricultural award at Farmworld 2014. Winner of the 2013 Bendigo Inventor Awards for Agricultural and Environmental Sustainability.